You’re a mother of two beautiful little girls. They’re kind and silly and happy. People tell you how smart they are. In restaurants, strangers stop you to comment on their polite behavior. And with each compliment, I see you. You soak the praise in. You relish in its glory. You pat yourself on the back, and you should. Live in the beauty of these kind words each day, because they’re true. As I write you this letter, you’re sitting in a hospital exam room patiently waiting for the neurologist and a possible diagnosis for your youngest daughter. And since I’m the future you, I know what’s about to happen. Before the doctor enters and gives you news that will forever change your life, I want to offer you some advice. 1. It’s OK to cry. In fact, it’s more than OK. Your grief isn’t something to be ashamed of. It isn’t something you should hide. Cry in the car on your way to work. Cry in the shower. Cry into your pillow at night. Give yourself one whole day or two to do nothing but cry, and then, never spend an entirety of another day only crying. Because if you do, you’ll miss out on all the beauty around you, and there’s so much beauty, so much love, so much laughter and so much happiness. 2. Surround yourself with positive and supportive people. This is easy, because the not-so-supportive people tend to voluntarily weed themselves out rather quickly. Finding other mothers who are going through a similar situation is a plus. Finding people who sincerely care is an added bonus. If you find both, you’re blessed. 3. You will make mistakes. Embrace this. Accept it. Learn from it. And move on. This is one truth about parenthood… no one is perfect. Being a parent of a typical child or a child with special needs doesn’t change this fact. 4. Don’t be afraid to ask questions and search for answers. Despite what other people will tell you: Google, Google and Google. Write down all the questions you have, no matter how bizarre. You aren’t at the doctor’s office to make friends. You are there to learn and to help your child. However, don’t let your quest for knowledge consume you. Balance is key. 5. Try not to compare. This is easier said than done. With each “Look who’s standing!” photo and every “My baby is walking!” video, your heart will ache. Remember: comparison only leads to hurt and anger. And there’s no room for those two things in the beautiful life you’re leading. Focus on all the amazing qualities and skills your daughter has. I guarantee you that list will be much longer and more important than the list of things she cannot do. 6. Because of the diagnosis you’re about to receive, you’ll become a much different and a much better person. And since I am you, I know you don’t believe this right now, but it’s true. From this moment on, you’ll look at the world in a slightly different way: with a little more strength, with a lot more determination and with an enormous amount of hope. In a moment, the doctor will tell you your child is not completely OK — that she will face a lifetime of possible struggles, delays and hospital visits. A lifetime of differences. Stay strong, keep positive and believe in yourself and your child. But, more than anything, when the doctor is done and you walk out of that exam room, I want you to re-read the very first paragraph of this letter. Read it when you sit at the doctor’s office anxiously awaiting results. When your heart is heavy from worry and your mind is bogged down by one too many Google searches, read it. Read it during moments of happiness and times of tears. Breathe it in until your lungs are filled. Dance in it. Swim in it. Carry it with you every step of the way. Because, guess what? Not one part of that first paragraph ever changes. 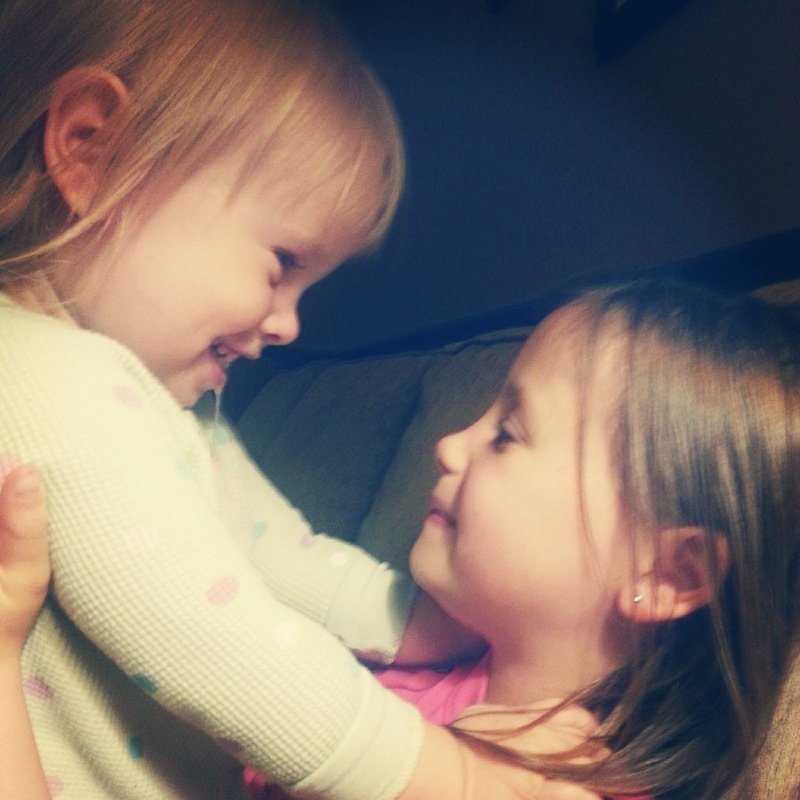 Diagnosis or not, you’re still a mother of two beautiful, kind, silly and happy little girls. And that’s what really matters. That’s the real beauty of it all. P.S. Have I told you lately just how incredibly lucky you are? I am a Graduate Student at Rochester Institute of Technology getting my Master's degree in Industrial Design and I've just found your blog. I'm working on my graduate thesis right now and I'm trying to find a way that design can have a positive impact on children with low and high muscle tone. I really need some input from parents of children with abnormal muscle tone and have put together a quick survey for them to take. If you wouldn't mind taking a look at it and possibly sending it a long to anyone you know who might be of help I would appreciate it more than you know. I would love to give you more information on my project if you're interested! The link to the survey is: https://www.surveymonkey.com/s/T5B7NSV. Liana - Completed. I would love to know more about your project.